I have a pantry problem. It is too full. I have been stocking up when I find a good deal, but I haven’t been using up. The cupboards in my small kitchen are so full that sometimes I don’t have a place to put all the boxes and cans when I come home from the grocery store. This is a good problem to have, to be sure — and believe me when I say that I’m not complaining — but it is still a problem. 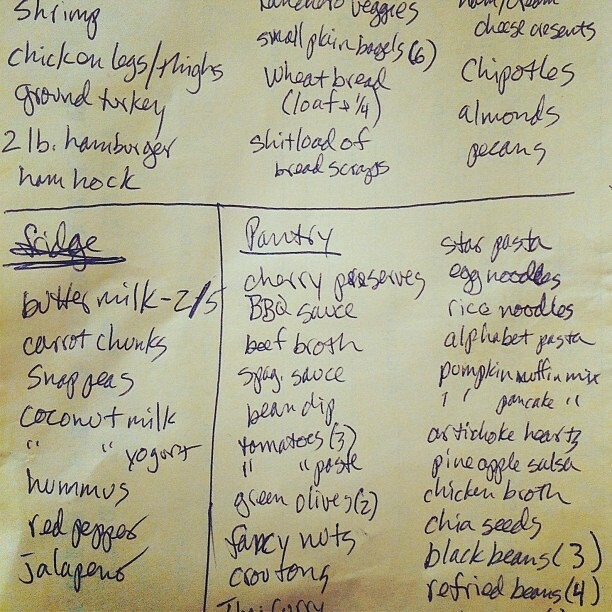 A couple weeks ago I decided that I needed to make a concerted effort to use all the food in my cupboards and freezer so I took a half hour to make a list of everything that was packed into them. Next, I pulled a few cookbooks off the shelf and hopped on the web looking for recipes that would use as many of my pantry ingredients as possible. I quickly came up with a list of dishes to try and one of them was a recipe for Ham and Bean Soup from the Cooking Light website. 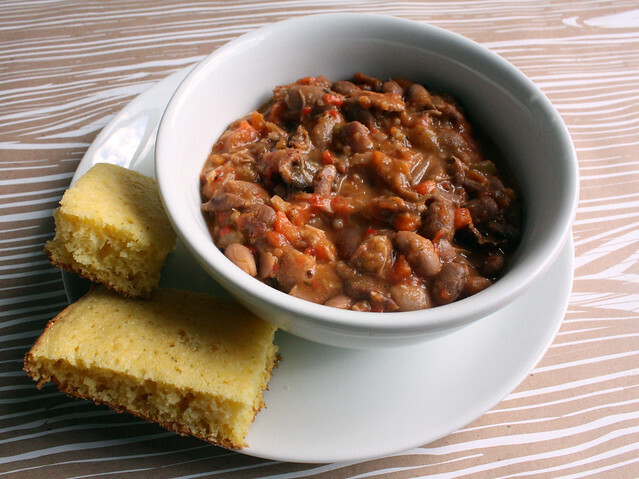 This was an excellent choice because I had almost all of the major ingredients tucked away already: dried beans, some leftover carrot scraps from a lunch, bell peppers and a ham bone in the freezer. I was a little skeptical that the kids would eat it because even though they like all the ingredients by themselves they’re often not keen on foods that are all mixed together. I made quite a few modifications to this recipe because I was determined to buy as few items as possible but I don’t think my changes significantly changed the character of the dish. To start, I used pinto beans instead of the seven bean mix. I also substituted a big ham bone for a purchased ham hock. I left out the onion altogether because I hate onions (did you know that?) and I used an extra red bell pepper and dried herbs instead of the green bell pepper and fresh herbs. This was very, very good and despite my fears, the children loved it. The soup was very hot when I placed the bowls on the table so I warned them to let it cool down for a few minutes before they started eating. While I finished getting drinks and such they both dug into their bowls and Wyatt’s portion was nearly gone by the time I took my seat. I’ll admit that it looked a bit brown and gloppy but it was smokey and salty and really hit the spot on a cold winter’s night. We all enjoyed the leftovers for lunch and another dinner too. How about you? Do you keep on top of using the stuff in your pantry? What are your go to recipes when you need to use things up?